There may not be anything more divine in this world than the corner slice of a square pizza pie. We’re talking Buddy’s Pizza, Niki’s Pizza, and yes, even Jet’s makes it on our list for its bold choice to take the road less round and make a pizza definitively our own. If you don’t have a favorite pierogi filling, then you should probably just pack up and move out of the state. These pan-sauteed dumplings were brought to Detroit by Polish settlers, and we can’t thank them enough. It’s always worth a trip to Hamtramck to grab some pierogi at Polish Village Cafe, and if you haven't yet, you're doing it wrong. Duh. Born and bred in Detroit, overly carbonated and freakishly sweet, this is the best ginger ale that has ever existed. Try to find this exact mix of the flavors "red," "yellow," and "blue" in any other state and tell me if you can. 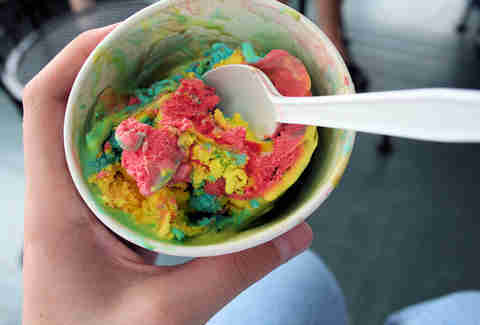 If you venture too far away from Michigan, you’ll only be finding imposter Superman ice cream. Made with Blue Moon ice cream (a northern Michigan favorite), the flavor is ridiculously sweet (seems we have a penchant for sugar) and entirely Detroit. Everybody’s got an uncle who brings home this most precious, nearly fat-free meat every year. Enjoy it as jerky, burgers, or steaks, and give thanks to the north woods and farm country that allow these beautiful critters to roam free, and then wind up on our plates. First: you need to pronounce it correctly. If you don’t know how, then you should be publicly shamed, tarred in glazed doughnut sauce, and feathered with powdered sugar. It should be a law that in order to live in metro Detroit, you must indulge in, at the very least, one of these gluttonous, gooey, filled pastries per year. 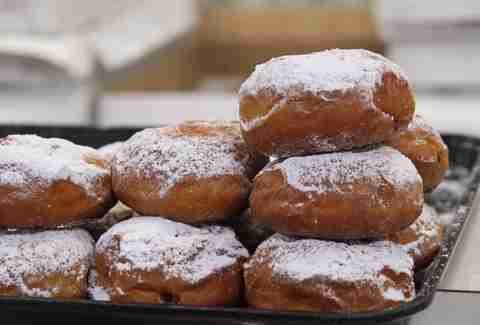 Fat Tuesday is the most appropriate time, but hey, part of the glory of living in Detroit is not having to count calories. A Detroit staple, and one of the longest standing micro-brews in the region, Motor City Brewing Works' Ghettoblaster is smooth, easy to drink, and a perfect accompaniment to outdoor summer barbecues. 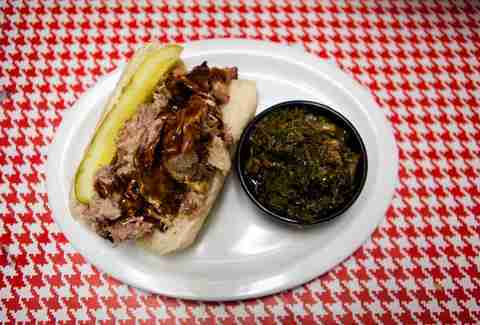 Every Detroiter has his or her specific go-to soul-food joint. Depending on your palate, it’ll be a spot that specializes in collard greens, fried chicken, pork chops, mac & cheese, and mashed potatoes. It’s the kind of food that sticks with you, and sometimes, it’s the only therapy you could ever need. 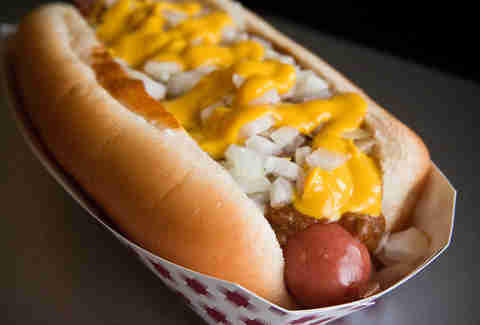 We often sing the song of the Coney here at Thrillist, but its importance in Detroit’s culinary landscape can’t be denied. What you really need to know is that it’s got all the food groups covered, and that it’ll never let you down when you need to grab a cheap, hometown meal. This company may be the ultimate purveyor in Detroit snack history. In business since 1930, Better Made has brought generations of Detroiters in close contact with the many illustrious forms of the potato. If you’re a Detroiter, chances are you haven’t been to many birthday parties, or in many liquor stores for that matter, where the flashy gold and yellow Better Made bags aren't part of the natural decor. After a 31-year hiatus, Stroh’s will once again be brewed in Detroit. Even while it was being brewed out of state, it managed to maintain its hold as one of the preferred light lagers of the city’s beer lovers. It is no crafty, sassy ale. It is what is: a cheap beer great for easy drinking. In addition to giving us beer, Stroh’s also bestowed upon us some of the finest ice cream you could buy during Prohibition... which is, unfortunately, no longer made in Detroit. But the name holds nearly the same weight as it did decades ago. While not as famed, per se, for barbecue as Memphis or St. Louis, Detroit is still a big meat city -- it is the Midwest, after all. Whether it’s knowing how to prepare a slab of ribs yourself, or knowing which joint in town has the best pulled pork, most Detroiters consider BBQ part of their food pyramid. Blessed with the four true seasons, Detroit is in prime location to enjoy a massive apple harvest each year. Take a trip out of the city to any number of working cider mills and enjoy this traditional, sweet fall combination. We in Detroit like to set things on fire and yell, "Opa!" It’s fun. What better to set on fire than a hunk of cheese in a frying pan? Head to the Greektown neighborhood to get your fill of this only-in-Detroit appetizer, served with lemon and bread. It goes down like a trainwreck, but it tastes oh so good. 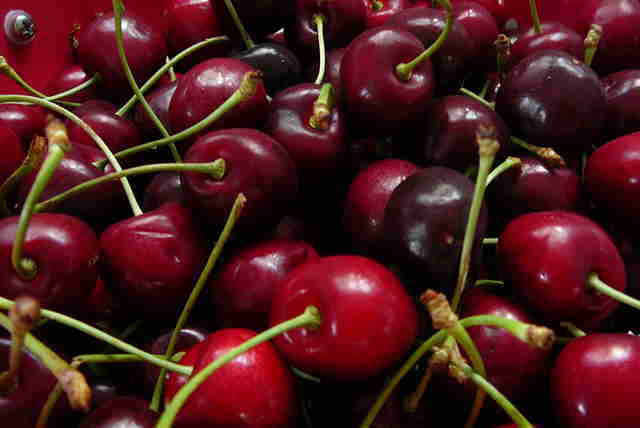 Being the nation’s most prolific cherry producer, Michigan's cherries hold a power that cannot be denied. There are few simple pleasures more Michigan than picking up some fresh cherries at Eastern Market on a summer Saturday. Expect to see them in Detroit as part of a pie, barbecue sauce, or covered in chocolate. A relative newcomer to the Detroit food scene, this marinated delight started arriving in droves with the Middle Eastern immigrant population in the later part of the 20th century. Since then, it's taken over as one of the best-loved sandwiches (pita form, please) or main platters at any number of restaurants across the city. For the best shawarma of your life, head to Bucharest Grill, or pretty much any food joint in Dearborn. 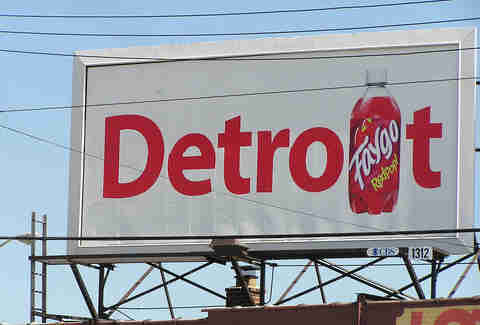 Not just for juggalos, Faygo is one of the finest pops to have ever graced this earth. Detroiters may be sad to travel to other parts of the world or country where, unfortunately, no one has heard of Rock N' Rye. Those sorry people have no idea what they’re missing. This should be the topping that you are given every time you seek an ice cream sundae... and if it isn’t available, you should not be afraid to revolt. OK, this is more of a Northern Michigan thing these days, but in the past, these meat-filled pastries were as easy to find around Detroit -- in the kitchens of Eastern European immigrants -- as shawarma pitas are in the present. 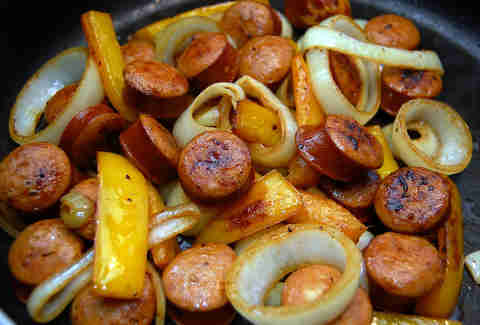 The absolute best form of sausage ever created by man. If you ever have any doubts in your life, eat some smoked kielbasa and watch all your troubles melt away like fat dripping off these babies and into the grill fire. They're best enjoyed prepared in a backyard over an open flame by your grandfather, whilst enjoying a Faygo or a Stroh’s. Leading Detroit’s food revolution was this fermented delight, which hit stands at local markets around 2006. They are tangy, fancy, and entirely addictive, and have spread to every corner of the United States, but remain at heart Pure Michigan™. Being a major port in the Great Lakes waterways, Detroit is of course home to many ways of preparing freshwater fish. The lake perch is a small fish and a common catch on the Great Lakes, and is known for its mild flavor. Whether pan sautéed or fried up as the main component of fish & chips, there's no wrong way to eat perch, and you should do it at least once if you want to consider yourself a Detroiter. Megan Frye is a writer based in Detroit and Mexico City. She would like to mix all the aforementioned items in a blender and create the ultimate Detroit meatshake. 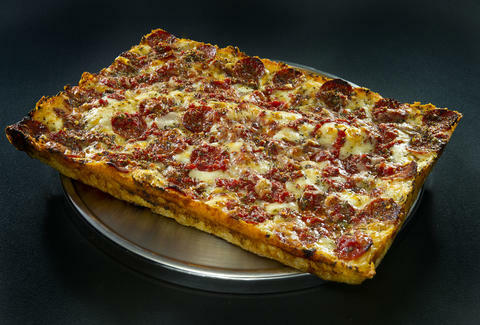 Tweet her your favorite Detroit foods at @fryechild.